Ever heard the saying, "a picture is worth a thousand words"? It turns out when it comes to marketing campaigns, this really is the case. Articles that contain images have 94 percent more views than articles without images. If you haven’t hopped on the photo bandwagon yet, you might want to look into it. Check out this infographic from MDG Advertising for some more eye-opening stats about using photos in your marketing. To get a few more tips on how to make your campaigns stand out, check out these great campaigns. When you think about interns, there’s probably a very distinct stereotype that runs through your mind: a college student holding the boss’s coffee with a facial expression that is a mixture of uncertainty about the future and panic about their next task. This may come as a surprise to some, but interns can contribute more than just coffee and doughnuts. In fact, they can help effectively grow your business. As young college students, interns have a perspective that your current marketing team may not. They see things from a different point of view — partly because they approach problems from a position of inexperience. But inexperience doesn’t necessarily mean naivete. A person who’s unfamiliar with your company’s day-to-day might be exactly what you need to gain insight into what may not be working for you. To interns, social media is like a second language that they’ve known since the MySpace days. Although the username vballgurl94 might not indicate she knows what she’s doing, your intern's daily experience with Twitter, Instagram and Facebook will be hugely beneficial to your marketing team. Updating a business’s social media presence is an extension of the very thing they do for fun. Nearly 69 percent of companies with 100 or more employees offer full time jobs to their interns. By hiring an intern, you have the opportunity to find the talent your business needs by “test-driving” them to see their potential. Good interns turn out to be the best full-time employees because they already have experience and familiarity with your company, and they have the drive and energy to push your company in the right direction. Have interns helped improve your marketing? Let us know in the comments! As the temperature continues to rise, more and more people are looking for ways to beat the heat this summer. Cue one of America’s favorite TV marathons of the year: Shark Week. Last year, Discovery Channel aired a fake documentary, which created a lot of negative buzz. Nearly one year later, people are still talking about it. We’ve got to admit, it’s impressive that they generated so much buzz that its ripple effect has lasted almost a year. We might not be able to replicate that, but there are a couple other things we can learn about marketing from Shark Week. Like Shark Week 2014, not every risk taken is 100 percent successful or unsuccessful. A lot of times, there’s a gray area where you’ll find both positive and negative buzz afterward. That’s when it’s most important to listen to consumers and learn from both sides. What went right? What didn’t? Keep track of what your customers are saying about you so you can tailor your message to better connect with them. Not sure how to do that? Allow us to introduce automated surveys. At the end of every call, a recorded voice poses questions to callers, who reply using their phone keypads. This information will help you figure out areas of improvement so you’ll always see smiles on your customers’ faces. 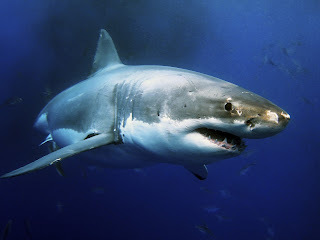 In the last few years, thanks to #hashtags and social media crazes, Shark Week has become an annual pop culture event. Many brands have sunk their teeth into the phenomenon and have joined the hype that surrounds Shark Week. You can even get a shark-themed ice cream cup! Of course brands know they’ll get a few extra eyes on their ads by including Shark Week themes. But the main reason they use sharky marketing is that they want to show consumers they’re up-to-date. If you’re using old news and outdated campaign slogans, people will think of your brand as old and outdated. Using current events portrays that your company is just as new-age and relevant as your ads. Now for some fun — what's been your favorite Shark Week show? Tweet your answer to @855callbright! How you take advantage of your social media platforms can make or break your company’s marketing strategy. Automakers are known for their 30 second television spots or their fast paced radio announcements, but what has become even more important is creativity and innovative marketing campaigns used on social media websites. This infographic highlights how the most popular automakers take advantage of social media to effectively reel in consumers. For more tips on how to upsell your dealership with social media marketing tactics, check out this article.